Here is my another quick creation of a robot. 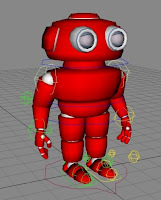 I have created the model and the rig using G-Max to share among my friends to practice animation. To check the Rig usability im doing a break-dance animation with this rig inside G-Max. Soon i will try to post a animation sample. Feel free to post any comments, I will soon share this rig over here.